Well, I did it. 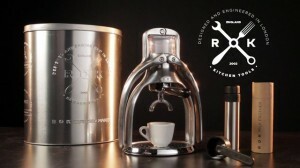 I went decidedly manual for my temporary housing situation in New York and purchased the ROK Espresso “machine”. This thing is also called the “Presso” machine in other incarnations apparently distributed by All-Clad. Calling ROK Espresso a machine is sort of odd, since these days you tend to think of machines as just more than moving parts. But, really, this is an art piece that is almost the very definition of a “simple machine”…physics on display and at work. It’s not much more than a VERY nice looking gear driven lever system with a plunger. Silent. Seriously, there’s almost no noise. “Green” – If you’re into that sort of thing, this setup is pretty low carbon footprint. After dialing it in, it makes drinkable results. Zero heat stability. The portafilter isn’t warmed by anything, and the top load water chamber is plastic, as is the shower screen. 9 bars of pressure? I doubt it. While I can definitely feel resistance on the arms as I push down, I can hear pressure escaping. Portafilter is not a standard size. Dialing it in could take significant time. So, that’s basically it. I paired this with a Hario Skerton ceramic grinder because I still want to start with fresh ground beans for the best chance at a good cup. The manual process, while again, silent, is WAY more work than my home setup of a Baratza Perciso and Bezzera BZ10. Grinding the beans takes a solid two or three minutes, and it’s not just as simple as engage portafilter and push button. It took probably 12 shots to get something I considered drinkable because adjusting the Hario is a massive chore in itself. Also, getting just the right amount of water into the ROK chamber is trial and error. The videos online show you where the suggested fill level, but it would be seriously helpful if ROK just put a small mark on the chamber for single and double water levels. I’m still working on it 3 days later, but I have actually produced a shot with crema. So, as I said, drinkable results are possible. But, you MUST have the patience to work with it. The milk frother is another interesting bit. It’s again, entirely electricity free and it actually works. However, knowing the food properties of milk, I find the instructions for it quite misleading. Milk looses it’s ability to create micro-foam when it gets hot. So, rather than froth warmed milk, I froth it ice cold, them warm it in the microwave. This has, so far, produced a reasonable creamy texture. Latte art isn’t possible (at least I’m pretty sure it’s never gonna happen), but a respectable latte or cappuccino is entirely possible. If you are the type that really loves the manual crafting process, then this machine is probably right up your alley. But, I wish they would make a few modifications. Change the water reservoir to a good thick Pyrex glass. That would help with heat stability. Change the shower screen to metal with a silicone gasket, rather than the single silicone piece that it is now. Change the “charging” process to pull in a measured amount of water from the reservoir rather than the full amount of water poured in. This would potentially allow hot water to stay in there for thermal stability as well as aid in precision dosing of water.